I LOVE hearing stories of Tarot readers who have gone from feeling nervous and a little overwhelmed about the Tarot, to feeling amazingly confident and in tune with their Higher Selves. 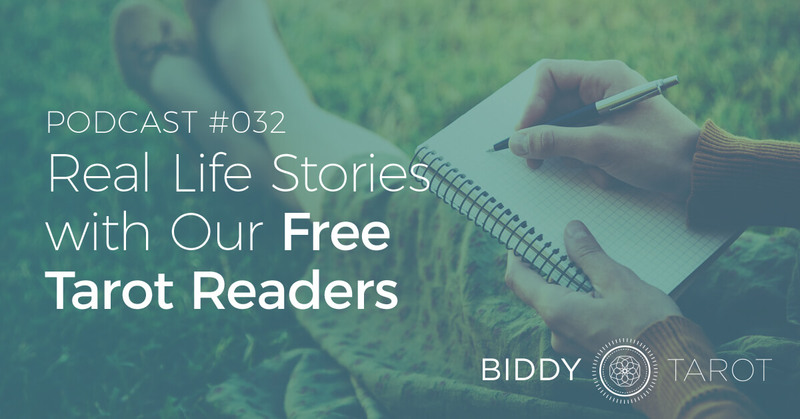 In this podcast, I am thrilled to share three inspiring stories from our Free Tarot Readers within the Biddy Tarot Community. These three Tarot readers have made the courageous leap to offer their readings for free, in exchange for feedback and for the immense learning opportunity. All three have grown as Tarot readers in leaps and bounds and are now reading professionally. Meet Duane, who recently became a professional Tarot reader after he built up his confidence offering free Tarot readings with Biddy Tarot. Meet David, who now aspires to integrate his HR and recruitment knowledge with his passion for Tarot to help people make conscious choices about their career. And meet Lorenda, who has learned to trust her intuition more deeply and can now share highly accurate messages with her clients. Listen to their stories and be inspired! Brigit: Hello and welcome back to the Biddy Tarot Podcast. It is so lovely to have you here. Today I want to share with you; three really inspiring stories from our free Tarot readers. These readers are offering free Tarot readings on Biddy Tarot as part of the community, in exchange for feedback and for practical experience reading for others. I think you will love these stories because they just show how you can turn these kinds of opportunities into amazing learning experiences for you as a Tarot reader. You will also see how these free Tarot readers have taken this experience and have started to really expand and grow as readers. All three have gone on to read Tarot professionally, but at the same time, they also have had these amazing learning experience that has really lifted their confidence and given them these opportunities to work with some many different kinds of clients and situations and questions and so on. Today I want to share with you; three really inspiring stories from our free Tarot readers. These readers are offering free Tarot readings on Biddy Tarot as part of the community in exchange for feedback and for practical experience in reading for others. Duane: You know, reading on BTN, I just didn’t have the confidence to really totally put myself out there, so for me it was, I hesitate to say it was a hobby but it was really more of something that I did with friends, family and stuff. But it wasn’t until after I got about half through BTN, it was like, I am in love with this. Yes, BTN was like, no question about it. The beauty for me now, because now I kinda have gone professional and am picking up clients and stuff, but I have no intention of dropping off of BTN because the one thing it does is that it gives me more diversity than I would probably get on my own. In terms of people from around the world, and different situations. But the beautiful thing is that you find out that people are all the same and when it comes to the spirit. They all have the same hopes, dreams, concerns, worries and stuff. It is just beautiful. Brigit: Yeah. Yeah that is a really interesting insight, because I think one of the advantages of doing the free readings is you get to see the big diversity, the different kinds of questions and cultures and expectations and so on. But as you say, there is kind of like this thread that just goes through all of that diversity and brings it together. And the way in which you can serve that diverse community is actually in a very, sort of wholesome consistent way, I suppose. Duane: Yeah, and I actually am finding that I prefer to do readings this way in terms of email, because for me, my rhythm is, I will do a reading tonight yeah, but it was assigned to me yesterday. It gives me an opportunity to see what the clients question is and then sit with it, let that energy move in and then formulate my questions in pick which deck that I am going to use and everything. It just gives me a little bit more of a space to connect more deeply with that person and what they are looking for. So I love it, I mean, I get generally pretty solid feedback, I think of all the readings that I have done, I can probably count on one, maybe a hand or two at most, situations where I never heard back, at least so far. Duane: So, I’ve had great success there and I don’t look for the feedback anymore. I mean early on, as I was building my confidence, the feedback was really important, but and I would type out my response and then go back and reread it and make sure. At this point, I am so confident, I just, whatever spirit is moving through me, whatever is coming out goes on to the email and then I hit the send button. It is like, it is what it is, you know? Brigit: Yeah, and then I suppose having the experience with the BTN and doing free Tarot Readings, how has that been for like your learning journey or how has it developed your Tarot reading skills? Duane: Well, it is all about practice, right? And again, it is that diversity that is really quite interesting because you get the opportunity to reflect a little bit about somebody, even the cultural differences when people ask questions and things. So, it is, for me, I would even when I get to a point where I feel like I am really super confident, the cards are supernatural to me. I don’t foresee unplugging from BTN, because it is just yet another outlet and I feel like it is almost becoming more of a service opportunity for me. So, now that I have my professional practice going, here is an opportunity for me to give back to the world in a unique way. Brigit: Yeah, that is wonderful. I know sometimes when I have looked through some of the requests that are coming through, I kind of think: “Oh, I would love to jump in here and do a couple of readings too.” And I really resonate with that idea of offering a service and perhaps it is also helping the general public get a balanced perspective on Tarot. 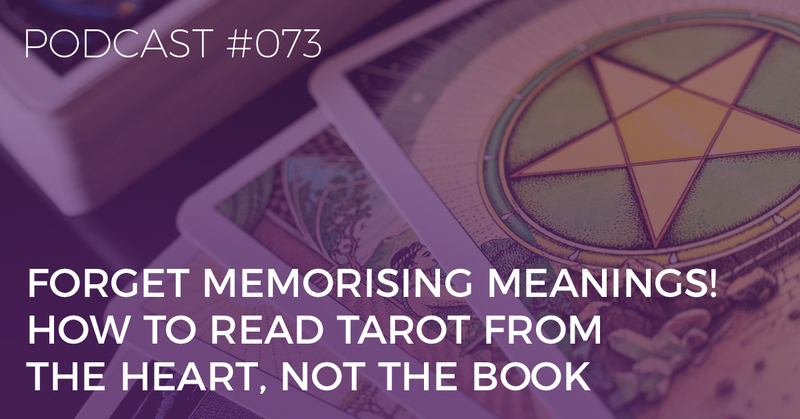 There is so much, unfortunately, crap out there, it is really great the more that us doing professional, ethical readings, if we can get that out there, we are changing the way that people see Tarot. Duane: Yeah and I have had a lot of people in my private practice now, because I talk about that I do these free readings with BTN and they are like: “Well, how does that work?” And they are really curious about that, and I think your right, it does elevate the practice and the divine quality that comes forward and the ethical Tarot reading because people, are kind of like: “Wow, you can actually connect with people that you have never known and you are doing it via email and it’s accurate?” It’s like, yeah, because that is the way spirit works. And you just kind of get the wow, you just blew my mind type of thing. Duane: Reactions, so yeah, you are absolutely right, it just helps to move all of us into a better place in terms of the minds of the public and what their perceptions are. Brigit: Yeah, wonderful and how is doing the free Tarot readings help to, now in your professional reading practice? Duane: Well, I think for me, at times it’s a matter of me, I guess being put on my game, right? Because some of the things that I get in my professional practice is pretty much I can anticipate what is coming, because I know a lot of these people now and so, I have a general idea of what their needs are and I know them at this point. Having done a number of readings for them. But this is always some strange question or some request that is like, oh, I haven’t had this one before, you know? And so, it continues to expand it expands my ability to be able to look at the cards in a different way. It challenges me to continue to be deeper into the cards, because some of the questions are very, very different than what you would have expect maybe in a face to face or somebody that you know at least, right? Brigit: Yeah, wonderful. Excellent, and another question, has just popped into my mind, if you were to talk to someone who was at this very beginning of their journey with Tarot and they are thinking: “Oh my goodness, do I do this or do I give free Tarot readings or I don’t.” What would be your advice, one piece of advice to someone at that point in their journey? Duane: Well, the only piece of advice is you don’t get any better just staring at the guide book or re-watching video classes or whatever. You just have to get out there and do it and BTN is such a safe environment because of the way you set it up, it is just that people kind of understand that a lot of the readers are just getting started in their practice so that feedback is really, really important to them. So, yeah, it is just a matter of just get in there and do it, right. Brigit: Yeah, absolutely, great advice. And one final question for you, particularly as you are reading professionally, where can people find you if they wanted to connect with you for a Tarot reading? Duane: Well, the only way to find me right now is via email. It is [email protected] I am in the process of totally revamping my website and adding some other things to my practice, some crystal healing work and some angel card work as well, so I am totally reworking it so at some point it will relaunch, but email is the only way to get me right now. Brigit: Wonderful, awesome, thank you so much, Duane, it has been really, really good. Our next free reader that I want to introduce is David. David is a Scotsman, but living in Sydney, Australia. Welcome David. Alright, tell me what was reading Tarot like before you started reading on the free Tarot reading site? David: So, for me, it was, I did an intensive Tarot course to get me started and absolutely fell in love and it felt like a real kind of natural thing for me to be doing, but then obviously I needed to practice so I was doing a lot of readings for friends and reading for myself and grabbing anybody that I could to read for. And that was really good, it was really useful but it was kind of limiting because there was only so far that I could take that. And it was just, I was kind of missing dealing with, not necessarily strangers but dealing with people that actually had burning questions. Because it was more like I was forcing it, I was like oh, have a reading, have a reading other than people actually saying: “I need a reading or I got an issue that I want to question.” So for me, at that stage I didn’t feel confident enough to put myself out there, definitely not as a professional reader or even to put myself at charity events, so then I thought that I didn’t feel like I had enough, kind of breath of experience and enough knowledge to go that far. So that is why I started looking for options to offer free readings, to really build that experience, so that is what kind of led me to the Biddy Tarot Network. Brigit: Yeah, wonderful and once you got there what has been your experience of giving free readings, what has that been like for you? David: I can honestly say in terms of Tarot journey for me, it has been absolutely amazing and with out a doubt the most valuable thing that I have done in terms of learning, in terms of dealing with real people with real issues, with real questions and been able to feel like actually adding value, you know you’re really able to help these people. So, there is a couple of things it really helps with confidence, because the real kind of golden nugget is that you are getting feedback, you are getting constant feedback and some times it is really detailed, you know some people just send the reading was really great, but others just send in really detailed feedback so there is a couple of things that it gives you. A, it gives you confidence to know that you are actually giving accurate and safe readings, but at the same time, just also give you confirmation that you are doing the right thing, that you are actually helping and these people are, and your guiding these people on a path. But just through the being able to practice for free readings as well, it gives you an opportunity to try new things so you are constantly learning. I started reading reversals, and I have gotten new decks or I wanted to practice with the new deck so I was practicing that and then even new spreads, discovering new spreads on the way. And at first I was a little dubious about reading online because everything I had done, my practice so far had been face to face, and I thought how would this work, will I be able to connect with people, but very quickly, I mean as soon as the feedback started to come in, I know you have been there, even when you just start reading, you can feel that connection and it was absolute confirmation for me. This works, it really does work and online is no different to me from reading face to face. In some ways, I think it can be, you can get even more insight because you really rely on your intuition rather than, kind of relying on what your seeing in front of you. That is what I have felt anyway. Brigit: You just have to go for it, don’t you? David: Definitely, both are really good and both are good for different reasons but it does, you are absolutely right, it keeps you on your game, it keeps it interesting as well. Brigit: Yeah, wonderful, and having been part of the free Tarot readings, what has it enabled you to do now that you couldn’t do before? David: So, I have, this has unlocked a Pandora’s box for me, I have got a hundred ideas going around, but in the last month, I have launched my website, I have launched my Facebook page and started reading professionally as well. Which is really good, I have also started reading at markets on the weekends, so I am doing face to face readings as well as online readings. It is just, A, I have got the confidence, B, I just have found that I have done so many free readings, that I really have been able to tap in much quicker, so I am able to flick that Tarot switch on and start reading really quickly. Where as before I had to really, you know, I was with the books, I was studying, I was trying to deliver them, but now I can just switch on, I am definitely still learning, I would never profess to know everything, there is still a lot to go. But yet, I have got other exciting projects in the works, like for instance, my day job is I do HR and recruitment at the moment, so I am looking at a way of combining and maybe doing some kind of course where you can, through my day job and through Tarot, to help people unlock what really their skills are and to help them identify what that dream job is and then look at kind of practical steps to help them get on that way. So, that is one of the things I am working on, but I have got a hundred others in the mix, but it is all very, very, very inspiring and really kind of helped me, it has given me a new kind of energy and a lease on life as well. It has been great. Brigit: Wonderful, and it is so exciting to see Tarot integrating with all sorts of things, particularly HR, like I also have an HR background and I always thought how on earth will HR and Tarot ever come together. But they can, you know, career advice, I love doing career readings because you not only adding new Tarot insights, but you also have got clear knowledge around HR and recruitment, for example. It is great to see that come together. David: Yeah, I love when I get, through the free readings, when I get the career questions because it just feels, I mean I like answering a broad range of questions, but the career ones, I feel like that I can add an extra layer because I can connect my kind of knowledge of that side as well as my Tarot knowledge. So, it just adds an extra layer I suppose. Brigit: Yeah, wonderful, and I think it also speaks to people from all walks of life can read Tarot and I think that is a great thing because it means we can each bring our own unique skill set and knowledge on to the Tarot table, so to speak. And, you can work it in all sorts of different ways that make it really exciting. David: Definitely, and that is what I have discovered just through this whole journey, and through the community that you have created as well. There are so many different types of readers and there is no right or wrong. But my style is very practical, very down to earth and I try to take the mystic out of the Tarot in some ways and just make it a really practical tool for helping people through the life journey. But other people are reading in a completely different way and I would never, ever judge that because I think that there is just so many different paths that you can go. That is what keeps it interesting, and I think, for clients it should be about finding the right reader for you. Brigit: Absolutely, yeah, if you where to speak to somebody who was perhaps at their start of their Tarot journey and they are thinking: “Oh do I do free Tarot readings or not?” What would be your, kind of, one piece of advice to them? David: I am a huge advocate, I would say, 100% do it and I would say you need to do it. It is something that anybody that I speak to that shows slight interest in Tarot, I point them to the free reading site because the Biddy Tarot Network has been invaluable and genuinely I think it is an essential piece of anybody’s learning to do readings and to do readings for strangers as well and to get feedback. So I would say absolutely do it, help the confidence, make the jump because there is, what is great about it is, people know what they are getting into and they know they are working with aspiring readers. So you have a chance, you will make mistakes and that is fine, but this is how you learn, it is a huge learning opportunity. Brigit: Yeah, wonderful, excellent and David, you are reading professionally, where can people find you if they wanted to have a reading with you or connect with you in any way? David: My website is www.tarotavenue.com and my Facebook page is just tarotavenue. Brigit: Wonderful, we will make sure that those are included in the show notes, so that people can click through and check you out. Thank you so much, I am thrilled to bits that your experience has not only helped you on a learning level, but professionally and that it has given you that confidence to now start your own business, that is just awesome. David: No, well, I want to say thank you to you and this has just been an amazing ride so far and I am looking forward to continuing the journey. I am still doing free readings, because I still find it really useful and I will continue to do that as well. Brigit: Yeah, fantastic, awesome, alright thank you very much. Thank you so much David, I really appreciate our conversation. Our last reader that I would love to introduce to you is Lorenda. Lorenda comes from Indiana, in the US. Welcome Lorenda. What was Tarot reading like for you before you started reading on the free Tarot reading site? Lorenda: Well, to be honest, I like to refer to reading Tarot cards as learning and communicating in a foreign language, that is how I try to explain it to people, that I am learning a language of my guides. The difference between doing the readings here and there versus about three to four times a week with Biddy, in addition to my growing clientele is the difference between taking a Spanish class once a week versus going to Barcelona and being immersed in the language. So, before Biddy came along, I guess, before I found Biddy, my readings were more hit and miss without the consistency of doing them on a regular basis. I feel like I wasn’t learning and growing as fast as I could be. Also, wasn’t near as confident as I have become since starting back in November. I feel like that BTN has really has helped me take the frustration of memorizing the meanings of every card out of my readings. Brigit: Yeah, awesome, wonderful, and what was the trigger point for you that said, ok I have got to do this? Lorenda: You know, it is just one of those things where I have been playing around with cards for a long time, I have done readings for friends and I have done some paid readings but I like to go online and just check things out and check out different meanings of things and I just kind of stumbled along and it just jumped out at me as something, Oh, I can do this, this is really cool, I like this and I just started clicking around the site and it was literally that fast and that easy. Brigit: Yeah, yeah wonderful so it was just kind of like you just knew this was gonna help you. Wonderful, so once you got in there and your doing free readings what has been your experience so far? Lorenda: Well, at first I was really nervous that I wouldn’t be able to connect with people’s energies, much less read for them or answer their questions. But I found that reading for people I don’t know, online has been remarkably easy. Because sometimes, I find with phone readings or even in person readings I would pick up on their body language or their reaction and I found that, or that they would make some sort of vocal, oh or oh really, you know so when you get those reactions you tend to second guess yourself when you are still learning and trying to figure things out. So then, I would, I would second guess myself and I would kind of backtrack a little bit where when I am doing these online, I am just listening to what I am hearing and I am putting it out there. I try to do everything in a positive light of course, but I am not afraid to tell the stories that my guides are showing me. Sometimes I will see things that I know are my situations that they are trying to, again, kind of translate a language so I have to find keywords to give them within these readings and kind of explain, ok, this is what I am seeing, this is the word I am hearing, so hopefully this relates to you. And then, I find that by doing that I find that I can leave it all out there, hit send, be done and then to hear the feedback later is even better because then sometimes, they will be like: “This absolutely made no sense to me, this is really the situation.” And then I can go back and do, not a follow up reading, but more of a ok, this makes sense, I can plug these things in and explain a little bit better and then it all comes together, but the initial send off of that message is so much easier than doing in person readings. I know that sounds crazy but it is just so much easier. Brigit: Yeah, it is kind of counterintuitive isn’t it, because you would think that email readings could be harder because you are not getting immediate direct response. Brigit: I think, you know I really resonate with that idea that you kinda just have to put it on paper, inbox and send it off and hope for the best, kind of really pushes you to up level your game. Brigit: And it is great also to hear how you work with your clients feedback so that you are seeing that kind of as an intuitive process and if you do get feedback that maybe this thing was off target and you are taking that going, well maybe how else could I look at it that sort of fits what I have heard. Lorenda: Yes, absolutely, and it really has made a difference in some of these readings when I have just kind of gone off on, not on a tangent but kind of gone off on my thinking and how things are going and to hear their input truly does, it just brings it full circle and it makes me feel better to know that I am on the right track so then I just have to make notes, ok, note to self, when I see that particular person in my vision that I am hearing Grandma, that doesn’t mean that I am seeing their Grandmother, that means that I need to say the word Grandma right now. That could anybody’s Grandma but I just need to say the word Grandma. And so when I see, what I noticing is that the more readings that I do, and this is where this the BTN has really helped me is that the more I do the more I start remembering and processing, oh wait I saw this in another reading that I did, obviously this is not their person that I am seeing, but this is the word that I need to say right now. And it makes so much difference, so much difference and I am starting to see an improvement in my readings and more accuracy in the readings. Brigit: Wonderful, it kind of feeds into that idea that intuition is a muscle and you have to keep working that muscle. Brigit: For it to get stronger, yeah, wonderful. And tell me now what are you able to do with your Tarot reading practice that you couldn’t necessarily do before? Lorenda: The big thing that i have notice, is that I have a network of people to work with. Kind of where I live, I know there are a lot of people that love Tarot cards and psychic parties and they love all these things but they would never say it out loud. But if you invite them, of course they are going to do it. But they would never tell their friends. So, it is really hard to find that network of people, but what I have found is that being one of the free readers, you know I have access to all these tools and all these resources and I can bounce ideas off of people. I can read about their struggles or their interpretations of things and offer my input as well and the resources of the networking has just been incredible for me. Of course any time you are sharing energy, with people who have that higher understanding of the energy and how to be receptive to it, it is a really amazing thing to go through, I guess. It is nice, there is comfort in numbers, i guess. Brigit: Absolutely, yeah most definitely and are you reading professionally? Lorenda: I am, I have been in just probably really, I have been doing readings for a long time, but I just always felt bad about charging people and I had a reading by someone who is very well known in the industry and I think my guides, that was their point was: “You need to charge.” “No, I can’t do that.” And I feel like they kind of brought that reading to me because I actually, he said: “Why aren’t you charging, you wouldn’t go to work and work for free would you?” So yes I do, I do charge now, but it is only been really recently when I felt like I had the, a better understanding, and I feel like I had the confidence and the know how to really stand by my product, I guess, for lack of a better word. Brigit: Yeah, absolutely and do you think as you grow professionally, do you think you will continue to offer free readings in this kind of learning practice environment or do you think you see yourself shifting towards a full professional model? Lorenda: You know what, to be honest, I like, it is my way of giving back I guess, so I like having that connection I don’t mind doing the free readings. Because I know that there are people that need it, they need that, that time, that reassurance, that maybe they can’t afford to do right then. So it doesn’t bother me to do that and also the learning factor to keep on point. I am not going to be flooded with readings all of the time, you know my website is not going to be crashing for paid readings by any means, so this is a great tool for me to continue building my skills so then eventually I can do more paid than not. But I enjoy doing the free readings. Brigit: Yeah, wonderful and I have certainly have heard from the other two that I have spoken to that sort of joy around being able to give back and to continue the practice of reading tarot so that they kind of fuel your professional readings as well. Yeah, it’s cool. I f you were to talk to someone who is perhaps at the start of their Tarot journey, what would be kind of like your one piece of advice to them? Lorenda: Don’t read into it to much. Don’t think so much. It really is important to, before you even jump into this, step back, quiet your mind, find a meditation that works for you. And then when you look at the Tarot cards, whatever one you are drawn to, doesn’t matter what deck you are drawn to, whatever deck you are drawn to, look at it and see what you see in it. Don’t try to memorize everything, try to get an overall feel for the card is it, are you seeing sunshine does it feel warm, what kind of colors does it have, how does it make you feel? Because you know what, to be honest, no card has an absolute definite meaning. You can look, you can buy 10 different books and everyone of them can say that the fool means something different. Ok, so what I find is you have to find that underlying meaning of each of the cards and then understand what your guides are trying to tell you. You have to listen, more than talking you have to listen. And just trust that when you hear something, just say it, you know, just say it, put it out there, because chances are that it is not your thought, it is not your job to filter it either. So, that is what honestly been my biggest, the biggest thing I had to overcome, I had to stop assigning meaning to everything, I just listen, and it is not about me, it can’t be about me, it is about the person that I am trying to help, that is asking me the question. Brigit: Yeah, it is as if as if you are a conduit, is kind of how I see it and it is not your role to sort of manipulate the meaning, and I don’t mean manipulate as a negative thing, but you know like, sort of change the meaning or make it significant to that person, you only need to convey the message as it is in ints purest form. Lorenda: I am not, I will tell people, I am not the interpreter, it is not my job to interpret what they are saying or what they mean, it is just my job to translate, because not everybody speaks Spanish you know. So, if I am the translator in the room, I don’t have to understand everything that person is trying to say and what the message means to the person I am delivering it to, it is not my job. It is my job to just say the words and to relay the message, it is your job to figure it out. Brigit: Yeah, the translation analogy, I think is great. Because if someone is speaking in Spanish, you wouldn’t try to paraphrase everything that they are saying, you are just saying the words that they say, you wouldn’t put your own spin on that. Brigit: Yes, Interesting, as you are reading professionally is there a place where people can come and find you, what is your web address? Lorenda: Yes, I actually have my web page is called SIGN, it is an acronym for Spiritual Insight and Guidance Network, I have a Facebook page, that is a private page, so you have to ask to join, but I will let you in and then I also have my webpage is the same thing, so if you where to google search that, that would come up, but the actual web address is www.messagesfromtheotherside.weebly.com. Brigit: Wonderful, alright, we will make sure that also is in the show notes, so that it will make it super easy for people to click through and find out more about you. Lorenda: Great, great I would love that. Brigit: Thank you so much, that was absolutely wonderful and I am thrilled that you are enjoying the experience with the free readings. And yeah, we hope to continue seeing you doing awesome things. Lorenda: Absolutely, and one thing I would say if anyone is considering doing, being a free reader, becoming a free reader, probably the one thing I benefited most from is requesting my own reading going through the process first so I would know what other people on the receiving end would be expecting. So that is the about the only other thing I would suggest people considering it, I highly recommend it and I have to several people, because I have really enjoyed it. Brigit: Fantastic, awesome, well thank you so very much, it has been an absolute pleasure to speak with you. Thank you so much, Lorenda, I really appreciate it. Alright, it has been my absolute pleasure to share with you these three, real life stories. I think having listened to these conversations; you will start to notice a few key things. One is this opportunity that these readers have really grasped in order to build up their learning, their practice and skills and confidence with Tarot. You can just see, for each one of them, having had that experience, reading for free has really allowed them to grow in so many amazing ways as a Tarot reader. You will also hear this theme of being able to give back to the community and being able to serve and help others in a really beautiful soulful way. I think that is absolutely just lovely and the more that we can do that, the more that we can change the perception of Tarot in the general public and really give Tarot a wonderful name for itself. Which is a great outcome. Third, you have seen that doing these free Tarot readings has helped to elevate the readers. Particularly in a confidence level and has given them that next step into their professional Tarot reading careers. Each one of them is at the very early stages of reading professionally, but I bet if we connect back with them in a year’s time, they will have gone on to do amazing things. Thank you so much for listening today, now if you have resonated with the stories that these three readers have shared with us today, then I know you will love being a part of the Biddy Tarot Community. 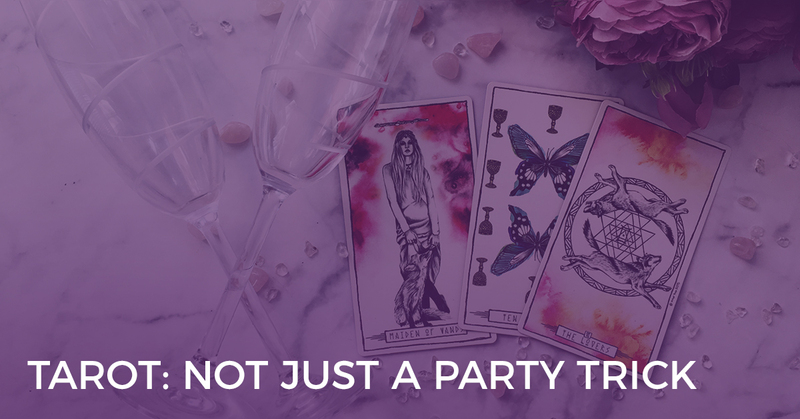 When you join the Biddy Tarot community, you have the option to also offer free Tarot readings, just as you have heard from the three people today. 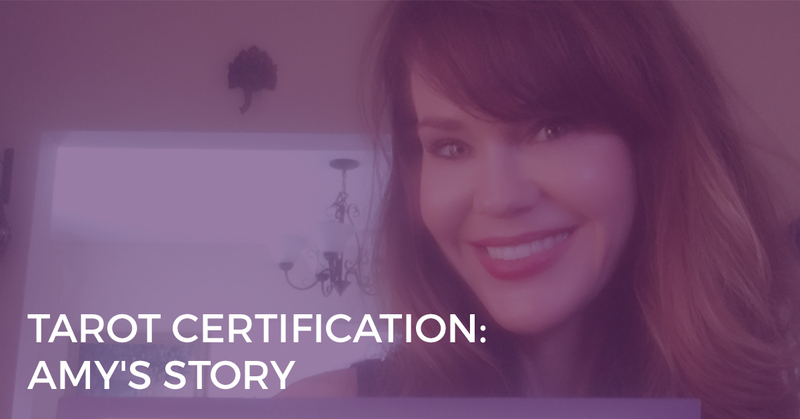 When you join the community, of course, you get access to live webinars, private forums, resources, Tarot 101 course and a huge amount more. In addition to that you can also start reading Tarot for free in order to build up your experience. Don’t feel like you have to do that if you are like: “That’s scary, and I am not ready for that.” You can still be a part of the community without doing the free readings. If you are ready to take your Tarot readings to the next level and really gain some of that real world experience reading for strangers via email, then I highly recommend being a part of the community so that you can do the free Tarot readings as well. As you have heard it is set up as a very safe and nurturing environment. Our customers know that they are having a reading with a student and they are obligated to provide you with feedback about the reading. It is really such a good learning platform to help you expand and develop as a Tarot reader. I am sure I don’t need to keep going on about it because you have heard what has been made possible for these three Tarot readers and that should absolutely speaks for itself. If you are interested you can find out more about the community at biddytarot.com/community. Wonderful, it has been my absolute pleasure to be in your ear buds today and I can’t wait to connect with you soon.